The staggered leaf scarf based on the repeat from the Japanese magazine that originated many of my recent posts is now completed. 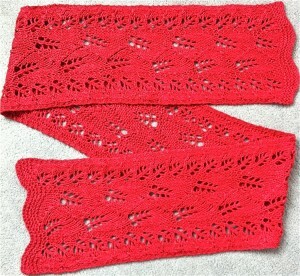 The scarf is knit in 60 % silk, 40% wool on number 8 US needles, measures 7.5 X 62 inches after blocking. The design is my personal adaptation. Here is a document including working graph and essential information for your personal use should you wish to attempt hand knitting the project final_leaf_scarf.